Artifact is a file, usually a jar. So Artifact Id is the name of the jar. for example, in the below dependencies, you can observer that, all artifacts are belong to same groupId. 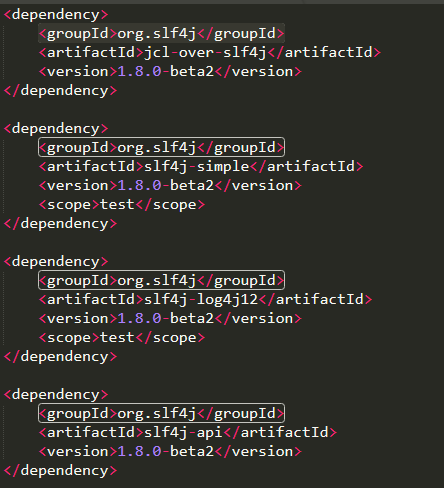 Here groupId is org.slf4j & artifacts have different ids. Below are the different ways to create an object in java. 1. Calling clone() method, actually creates a new object and copies all the contents of old object into it. Creating an object using clone method doesn't invoke any constructor. 2. To use clone() method on an object, we need to implement Cloneable interface and define clone() method in it. 1. when ever we serialize or deserialize an object, the JVM creates a separate object for us. JVM doesn't use any constructor to create the object. 2. To deserialize an object we need to implement a Serializable interface in our class. ConcurrentHashMap is concrete implementation of ConcurrentMap. Both are from java.util.concurrent package. 1. The functionality is similar to normal HashMap with better concurrency. 2. ConcurrentHashMap is thread safe. 3. It doesn't lock the Map while you are reading from it. 4. It doesn't lock the entire Map when writing to it, it only locks the part of the Map that is being written to, internally. When i was trying to build a project for eclipse, i ran the below command gradlew eclipse and i got below error. I searched in internet and found some solutions and finally the below solution is working for me. I executed below command and this fixed my issue. There are other solutions but this only worked for me.